It is spring and soon Easter! 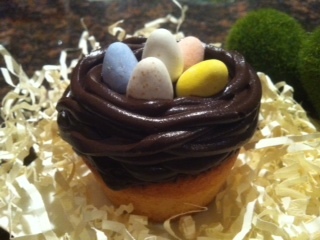 What better way to bring Spring and Easter in your kitchen by making those darling cupcakes? In a bowl whisk together flour, baking powder and salt, set aside. In large bowl, using a mixer, beat the sugar and the butter until light and fluffy, add the eggs beating well after each addition. Beat in the vanilla. Add the flour in 3 additions, alternating with milk. Beat well until everything is well mixed and pour in the cupcake mold up to 3/4. Bake in warm oven for 18-20 minutes at 350. Combine the butter and the chocolate in s small saucepan, melt the content over medium heat, add the cocoa and stir until smooth, transfer to mixing bowl and mix in the powder sugar alternating it with milk and beat until fluffy and smooth. Frost each cupcake with a teaspoon of frosting to cover the top of the cupcake. PLace the rest of the frosting in pastry bag, or a plastic bag. Cut the end of the pastry bag to make a small opening. Squeeze the frosting onto the cupcake to make it look like a nest. Place chocolate eggs on top to decorate.